Starting next week, Microsoft and Epic Games will begin an expansive beta test for the upcoming September Xbox 360-exclusive, Gears of War 3. The beta will unfold over a series of weeks, with tiered entry into the test for different groups, beginning next Monday for those who got a code with their purchase of Bulletstorm. While April 18 is the first day that most will finally get a sampling of the Gears of War 3 multiplayer, members of the media have been tooling around the beta’s available maps for the better part of a week. Today we can share a little bit of that experience with you readers, a taste of what is to come when the true madness begins on Monday. There are four maps included in the beta test. First is “Old Town”, a bright and cheery little village with cobblestone streets and chickens running free. The layout on this one takes a bit of getting used to, as some of the low-lying walls can’t be jumped over thanks to the decorative metal bars adorning them. “Trenches” is set in a windblown industrial yard, with an environment highlighted by lots of brown hues. It’s a dusty place, a fact which becomes clear when the occasional windstorm picks up during a match, severely limiting how far you can see. The best of the four are “Checkout” and “Thrashball”. “Checkout” is set in a rundown department store. A small, squarish map with only a few, easily observed routes across, and plenty of cover around to conceal yourself behind. More than on most other maps, the shotgun is your friend here. The same is mostly true of “Thrashball”, though that map features a much more open central space. The setting is a ruined Thrashball court (character Cole Train’s game), complete with a precariously dangling electronic scoreboard that will at some point during a given match fall right into the center of the fighting arena. 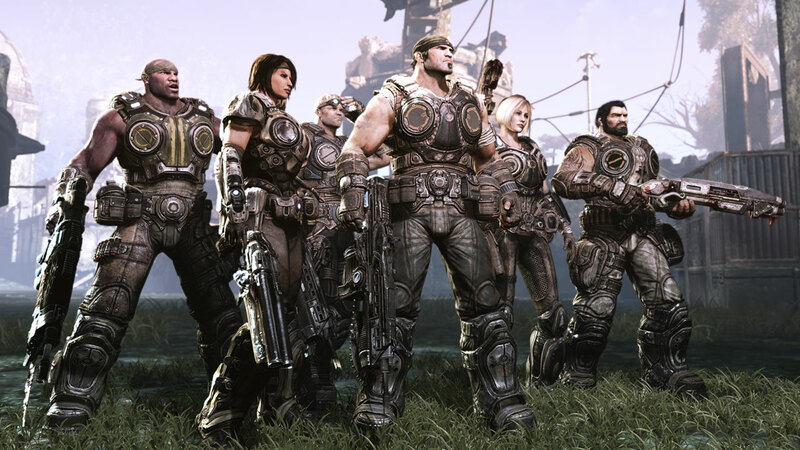 Team Deathmatch and King of the Hill (in which players fight to control small, constantly pieces of land) are joined by Capture the Leader in the beta, which is new to Gears of War 3. It’s essentially capture the flag, though in this case your “flag” is a specially designated human or Locust commander whom the enemy must take down, grab as a meat shield and drag back to their home base. It is, in a word, awesome. Before you start playing, you set up the multiplayer loadout for your in-match avatar, though that can also be changed between spawns in the heat of a match. There are three assault rifles in all: the chainsaw bayonet-bearing Lancer, the slow-firing, high-power Hammerburst and the new Retro Lancer, which replaces the chainsaw with a proper blade bayonet and features a special charging execution. The Hammerburst has also been tweaked in a rather cool way; click the right stick when you’re aiming with the left trigger to drop into a first-person iron sights mode, which cuts the weapon’s recoil down to almost nothing. There are also two shotguns you can equip as a secondary: the returning Gnasher and the brand-new Sawed-Off Shotgun, which offsets its extreme power with a one-shot clip capacity and painfully slow reload. Other weapons are scattered around the various maps, though at this point, with everyone still new to the game, it’s always a race to get to the good stuff first. Among that good stuff is the Digger Launcher, a fantastic new weapon that fires a torpedo-like grenade which burrows beneath the surface until it reaches a target and explodes. As long as you can see enough of what’s ahead to line up your aim correctly, there are no obstacles that will stop a digger once it is launched. That seems to be it for the new weapons on offer in the beta, though there could certainly be more. Experience points and medals (which breed XP) earned in each match contribute to your overall multiplayer level. Rising through the ranks doesn’t bestow any gameplay advantages the way it does in the Call of Duty series; instead, you unlock additional character models (much like the previous game) and weapon camouflage. The options are limited in the beta, though the final release will presumably contain a great deal more. Gears of War 3 isn’t out until September 20, but you can get in on the beta starting next week–provided you got a code with the purchase of Bulletstorm. If you didn’t get a code, you also have the option of pre-ordering Gears 3, which grants a beta code that can be used the following week. The beta will run until May 15.